Lauren, thank you so much for highly recommending this book! It was so right up my alley with what I truly love to read. 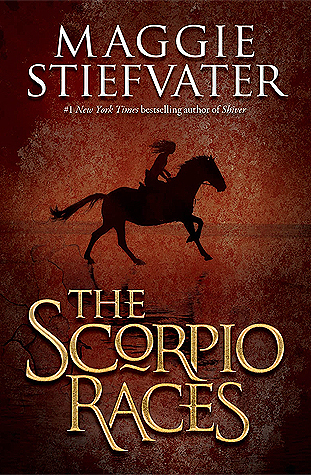 Maggie Stiefvater crafted such a great story with a believable storyline about "water" horses, orphans, the rich vs the poor and a romance that slowly grows between Kate "Puck" Connolly and Sean Kendrick, a horse-whisperer of the carnivorous sea horses. The island of Thisby is a hard scrabble place that needs the tourists the annual Scorpio Races brings, to survive. Puck and her two brothers have lost their parents to the flesh eating horses and life has been very difficult since then for them. Whereas Puck and Finn love the island, older brother Gabe has announced he is leaving with his two friends, because he can't take it anymore. Sean Kendrick and Puck alternate telling their stories. Sean Kendrick loves his Capill uisce, Corr and Puck loves her quarter pony; and it is Sean who stands up for Puck as the first female rider, against those islanders that challenge her. I really disliked both Mutt Malvern and his father. I wanted to like Mr. Malvern, but I could see that he was like Sean Kendrick (poor) but he was never going to let Sean or Corr go. I saw true evil in Mutt and it was difficult to read when he tried to "hurt" those associated with Sean Kendrick. But it was the slowly moving, delicate relationship of Puck and Sean that I applaud. Stiefvater takes two people who are animal lovers and through deliberate situations, moves them from strangers, to acquaintances, to friends and then a mutual respect and love. Highly recommended! Lauren, I am soo loving it, I am on page 285!